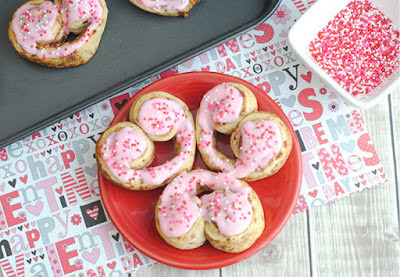 Valentine Cinnamon Roll Hearts are adorable, easy to make and perfect for Valentine’s Day breakfast! Open the cinnamon rolls and place on a baking sheet and set aside the icing. Gently unroll each cinnamon and roll the ends into a heart shape (see photos). Once all the cinnamon rolls are made into hearts, bake the heart for 13-15 minutes. Add 1-2 drops of pink or red gel food coloring to the cinnamon roll icing and stir to combine. Generously frost each cinnamon roll heart and sprinkle with Valentine jimmies. For these adorable Valentine Cinnamon Roll Hearts all you need is your favorite brand of store bought cinnamon rolls (I prefer the ones you can easily unroll), some pink or red food coloring and Valentine jimmies (optional). Follow our easy directions, frost and serve. Your loved ones will feel special on Valentine’s morning.